Martin Cooper of Motorola made the first publicized handheld mobile phone call on a prototype DynaTAC model on April 3, 1973. This is a reenactment in 2007. DynaTAC is a series of cellular telephones manufactured by Motorola, Inc. from 1983 to 1994. The Motorola DynaTAC 8000X commercial portable cellular phone received approval from the U.S. FCC on September 21, 1983. A full charge took roughly 10 hours, and it offered 30 minutes of talk time. It also offered an LED display for dialing or recall of one of 30 phone numbers. It was priced at $3,995 in 1984, its commercial release year, equivalent to $9,634 in 2018. DynaTAC was an abbreviation of "Dynamic Adaptive Total Area Coverage." Several models followed, starting in 1985 with the 8000s, and continuing with periodic updates of increasing frequency until 1993's Classic II. The DynaTAC was replaced in most roles by the much smaller Motorola MicroTAC when it was first introduced in 1989, and by the time of the Motorola StarTAC's release in 1996, it was obsolete. The first cellular phone was the culmination of efforts begun at Bell Labs, which first proposed the idea of a cellular system in 1947, and continued to petition the Federal Communications Commission (FCC) for channels through the 1950s and 1960s, and research conducted at Motorola. In 1960, electrical engineer John F. Mitchell, became Motorola's chief engineer for its mobile communication products. Mitchell oversaw the development and marketing of the first pager to use transistors. Motorola had long produced mobile telephones for cars that were large and heavy and consumed too much power to allow their use without the automobile's engine running. Mitchell's team, which included Martin Cooper, developed portable cellular telephony, and Mitchell was among the Motorola employees granted a patent for this work in 1973; the first call on the prototype was completed, reportedly, to a wrong number. While Motorola was developing the cellular phone itself, during 1968–1983, Bell Labs worked on the system called AMPS, while others designed cell phones for that and other cellular systems. 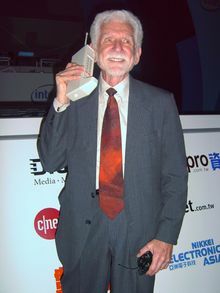 Martin Cooper, a former general manager for the systems division at Motorola, led a team that produced the DynaTAC 8000x, the first commercially available cellular phone small enough to be easily carried, and made the first phone call from it. Martin Cooper was the first person to make an analog cellular mobile phone call on a prototype in 1973. The Motorola DynaTAC 8000x was very large compared to phones today. This first cell phone was very expensive when it was released in the USA in 1984. The DynaTAC's retail price, $3,995 (about $10000 in 2018 ), ensured that it would not become a mass-market item; by 1998, when Mitchell retired, cellphones and associated services made up two thirds of Motorola's $30 billion in revenue. On October 13, 1983, David D. Meilahn placed the first commercial wireless call on a DynaTAC from his 1983 Mercedes-Benz 380SL to Bob Barnett, former president of Ameritech Mobile Communications, who then placed a call on a DynaTAC from inside a Chrysler convertible to the grandson of Alexander Graham Bell, who was in Germany for the event. The call, made at Soldier Field in Chicago, is considered to be a major turning point in communications. Later, Richard H. Frenkiel, the head of system development at Bell Laboratories, said about the DynaTAC: "It was a real triumph; a great breakthrough." U.S. Patent 3,906,166, September 16, 1975 for a Radio Telephone System. the cell phone. Martin Cooper, Richard W. Dronsurth, Albert J. Leitich, Charles N. Lynk, James J. Mikulski, John F. Mitchell, Roy A. Richardson, and John H. Sangster. N.B. Two names were botched in the original filing; Albert Leitich's surname was erroneously omitted, and Dr. Mikulski's first name was omitted. The original document was refiled by Motorola's legal staff, but has not yet been identified. The seeds of the idea for a portable cell phone can be traced to Dr. James J. Mikulski, which were rejected by Mitchell for lack of sufficient business justifications. It is rumored that when John Mitchell suddenly recognized during an attempted phone call that his 400 MHz phone had inherent limitations, he immediately reversed his previous decision and championed the portable cell phone concept. The DynaTAC 8 Series, Classic, Classic II, Ultra Classic, and Ultra Classic II had a display with red LEDs; the DynaTAC International Series with green LEDs, and the DynaTAC 6000XL used a vacuum fluorescent display. These displays were severely limited in what information they could show. The battery allowed for a call of up to 60 minutes, after which it was necessary to charge the phone up to 10 hours in a trickle charger or one hour in a fast charger, which was a separate accessory. While still retaining the DynaTAC name, the 6000XL was completely unrelated to the DynaTAC 8000 Series, in that it was a transportable phone meant for installation in a vehicle. The DynaTAC Series was succeeded by the MicroTAC Series in 1989. With the removal of analog network cells nearly all over the world, the DynaTAC models running on AMPS or other analog networks are mostly obsolete. Thus, they are more collectors' items than usable telephones. The International series, however, will still work, but only on GSM 900 cells. The DynaTac 8000X, due to its resemblance in size and weight to a standard clay-fired brick, was nicknamed the brick phone by users, a term later applied to other brands as a contrast to smaller handsets appearing in the 1990s. While it might be considered extremely unwieldy by modern standards, at the time, it was considered revolutionary because mobile telephones were bulky affairs installed in vehicles or in heavy briefcases. The DynaTAC 8000X was truly the first mobile telephone which could connect to the telephone network without the assistance of a mobile operator and could be carried about by the user. In certain markets, a brass swivel antenna was one of the aftermarket accessories then available. Available, too, was a snug-fitting zippered leather case which covered the entire body of the phone and had a clear plastic front to make the user interface accessible. It featured a sturdy spring-steel belt clip and a small cutaway at the top to allow the antenna to protrude. Charging could still be performed with the cover on, but change of battery required its removal. Dynatac relates to US phones used on the Dynatac system in the US, not phones in use in the UK. ^ "Motorola DynaTAC 8000X". Motorola Mobility 2011. ^ "The History of Mobile Phone Technology". RedOrbit. ^ Lane, Clare (June 17, 2009). 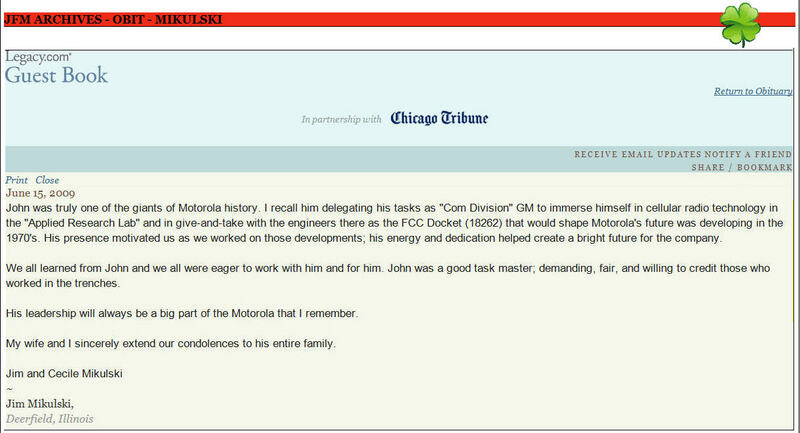 "John F. Mitchell, 1928-2009: Was president of Motorola from 1980 to '95". Chicago Tribune. Retrieved December 5, 2011. ^ a b Discontinuance of Product Line, Business Case Study Cell Phone[permanent dead link]; Macher, Jeffrey; Richman, Barak D. (2004). "Organizational Responses to Discontinuous Innovation: A Case Study Approach". International Journal of Innovation Management. 7 (1). SSRN 485282. ^ "20th Anniversary of the World's First Commercial Cellular Phone". Motorola. Archived from the original on 2007-02-19. Retrieved 2007-06-07.